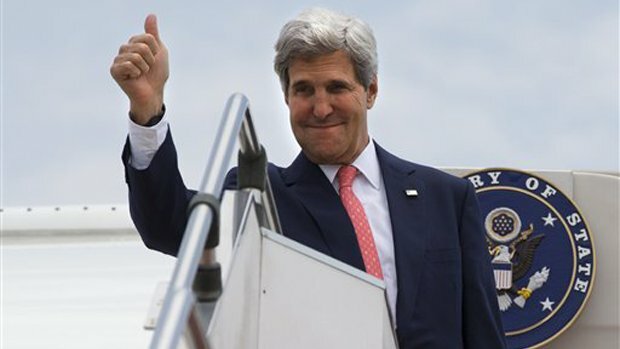 Lausanne: On the heels of the Secretary of State’s historic breakthrough in talks with the Iranians, the Daily Freier has decided to change its name to “The Daily Kerry”. Editor in Chief Aharon Ben Yekutiel explained the Board’s decision: “After this amazing event, the world should know that when you think of ‘The Freier’, you should think of Mr. Kerry. We are but a tiny newsblog, so it is an honor that ‘Freier’ and ‘Kerry’ become synonymous.” At first, the Editorial Board admits that it had doubts about the talks. According to Middle East Correspondent Harun Hakimoğlu, “To be truthful, we were skepical that anything could really be accomplished by a man who once lost a Presidential election to a guy who did not have a complete command of the English language and who once fell off a Segway. But he really went the extra mile to ensure that we have Peace in Our Time.” Harun continued; “We were really concerned that the talks would break down over President Obama’s previous insistence that the Iranian military facility in Natanz be closed, and by the President’s insistence on the dismantling of the centrifuges. But fortunately, that position proved to be in the same category as the Red Line against Syrian chemical weapons, ‘If you like your doctor you can keep him’, and #Bringbackourgirls. So there was some, you know, flexibility.” The Editorial Staff even presented the new name change to Secretary of State Kerry for his approval. According to State Department Spokeswoman Marie Harf, Mr. Kerry actually voted for the new name before he voted against it. Bravo! It is about time the Daily Freier Staff recognize pure genius…in our time.